The first time I ate ice cream with alcohol in, it made me cry. I was on holiday with my family in Italy, a much littler loaf than I am now, and we’d just emerged from eating lunch at our favourite local pizzeria. The kind of pizzeria with no pretensions, just incredible dough rolled paper thin, rich red tomato sauce spread over the top and milky mozzarella dotted between volcanic blisters of risen crust. By all accounts we should have been full, but anyone with even the slightest sweet tooth will understand that there’s full, and then there’s the pudding stomach. Normally we’d have jumped in the car and headed up into the walled town to get a cone of homemade ice cream from one of the local bars, but for some reason or other we had to get on the road. If memory serves me correctly it was raining, so my Dad hot footed it into the next door café to grab a couple of cornettos for my brother and I to eat in the car 0n our way to wherever we were going. Eating a cornetto is such an exciting thing when you’re a child. There’s the foil crimped round the top to carefully prize back, the round carboard lid to remove (making sure to lick off any excess chocolate stuck to the underside before disposing with it) and the paper wrapping to tear open then peel back in a slow circle until the top of the ice cream is completely revealed. When you’ve eaten the whole thing and just a tiny foil cone remains, you then tip the final chocolate filled chunk of crispy wafer into your mouth for a final burst of flavour before licking your lips and wiping your grubby fingers. Preferably not on the car seat, or your older brother, as I fear may have occurred more than once. So, I’m in the car, I perform the necessary rituals and I prize a little fleck of chocolate topping into my mouth. So far, so good. Then it’s time to take a big long lick of the creamy coloured ice cream underneath, and that’s when the tears begin. My dad didn’t read the label properly and the after lunch treat he’s bought for his five year old is actually a whisky flavoured cornetto. Oops. When writing this post, I googled ‘Whisky Cornetto’ and there doesn’t seem to be a lot of information available. I’m not sure it was ever on sale in the UK, but from the look of various forums it has definitely been discontinued in Italy – maybe more parents made the same mistake as my Dad, maybe it didn’t sell that well, but for whatever reason, if you want to find an alcoholic ice cream nowadays, you’ll have to look elsewhere. And sometimes an alcoholic ice cream is exactly what you want. Since those formative years in the family car, my tastebuds have developed somewhat, and although I’m not a big fan of overly boozy desserts, sometimes a sniff of something sybaritic can really give them a lift. One of my favourite flavours ever is the vin santo ice cream made at the River Café (which I’ve replicated here), so a couple of weekends ago when deciding what sort of ice cream to make to accompany some chocolate fondants, I decided to tweak the recipe to use up the end of an everlasting bottle of Frangelico that sits on my sideboard (delicious in desserts but I’d never drink it on its own). While I love the contrast of cool, creamy, boozy ice cream with a rich chocolate fondant, I wanted to add a bit more texture to this dessert. 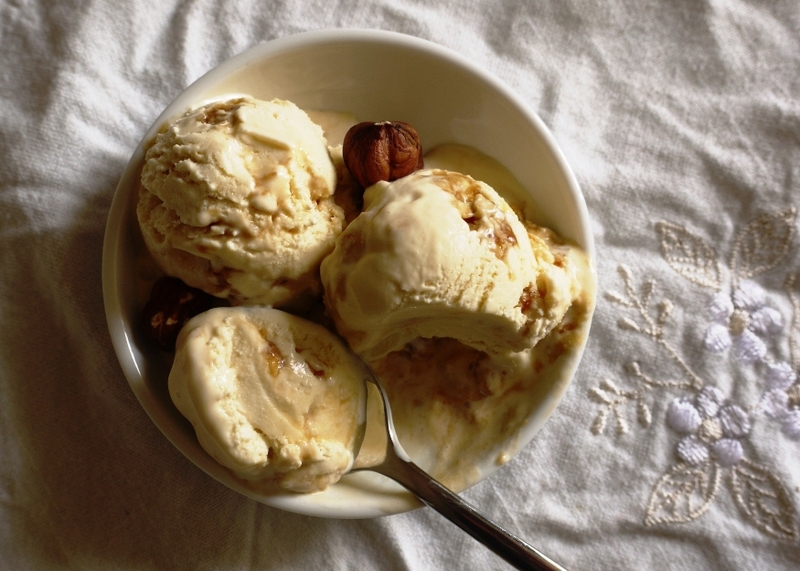 Recently I’ve been making a lot of hazelnut praline – I can’t get enough of the stuff – and wondered how the crispy shards of nutty caramel would taste if churned through ice cream. The answer is amazing. Because alcohol stops ice crystals forming, the ice cream stays beautifully soft, smooth and scoopable, while the praline melts into the creamy base to become both chewy and crunchy all at once. The flavour is rich and toasty, with hints of caramel, a tang of alcohol and a mellow, nutty aftertaste. I only had a tiny amount left after our dinner party to take some pictures, so the photos in this post really don’t do it justice, but I urge you to try this ice cream. While this recipe is lovely just as I’m presenting it, it’s also infinitely adaptable. 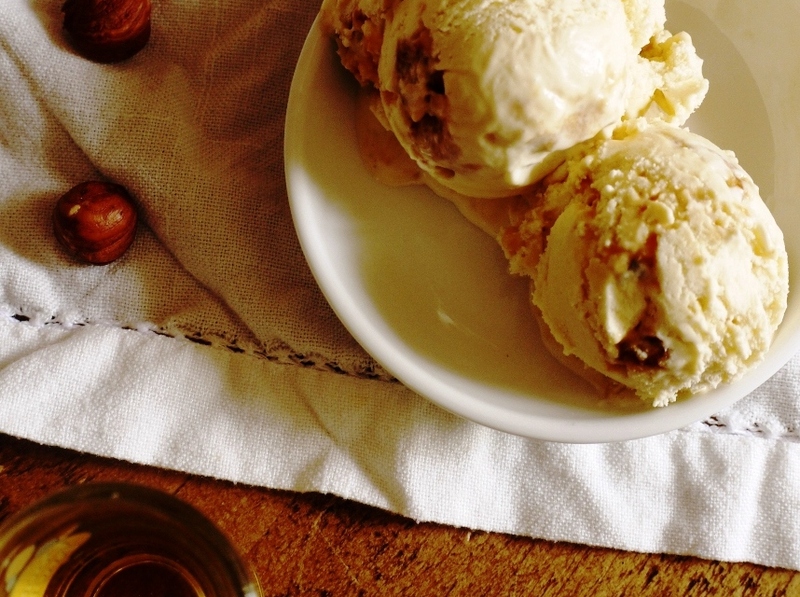 Why not make a traditional almond praline and stir through an amaretto ice cream, try it with pecans and Bourbon, or peanut praline and a chocolaty liqueur? Replace the praline with crumbled cookies (Oreos, Bourbon biscuits or spicy speculoos) or syrup soaked sponge, or try any number of dessert wines rather than a liqueur. As long as you’re careful not to add too much booze (this can prevent the ice cream from freezing at all), the world really is your oyster with this recipe. You could even stuff the ice cream into cones, top with chocolate and make a homemade cornetto . . . as long as you don’t offer it to any unsuspecting kids. Line a baking tray with a silicone baking mat. Spread the sugar on the bottom of a heavy bottomed saucepan and cook over a medium heat until it begins to melt around the edges. Drag the melting sugar into the centre of the pan with a heatproof spatula then stir gently until all the sugar is melted. Cook until the liquid is a deep amber colour, then remove from the heat and stir in the chopped hazlenuts. Pour the praline in an even layer over your baking mat and leave to cool and harden. Once completely cool, blitz in a blender to a coarse powder. The praline will keep for up to a week if you want to make it in advance. Whisk the egg yolks and sugar together until light and frothy. Heat the double cream in a medium saucepan with 50ml of the Frangelico until warmed through. Remove from the heat and pour over the egg and sugar mixture, whisking continuously until combined. Return the pan to a medium heat and cook your custard until it coats the back of a spoon. Remove from the heat and stir in the remaining 110ml Frangelico. Strain into a large mixing bowl set over an ice bath and whisk until cooled. Chill thoroughly in the fridge before churning in your ice cream maker. Just before the ice cream is ready, pour in the praline and allow to churn until incorporated. Spoon into container and freeze for at least four hours before serving. Because of the high alcohol content, this ice cream should be nice and soft served straight from the freezer. Perfect with a hot chocolate fondant, or drenched in a shot of coffee for an adult take on an affogato. Hi, can i make this without an ice cream maker and if so how? Sounds wonderful – and it’s warm enough today for ice cream!! I really loathe liqueur chocolates, but alcohol infused ice cream is something wonderful where the booze really adds to the experience. I could never tire of it! Tandy – I don’t like it too boozy but I think the ice cream moderates this for you – too alcoholic and it won’t freeze properly. Nature’s way of enforcing the most perfectly balanced dessert! Helen – if you don’t have an ice cream maker simply freeze the custard with praline stirred in for about an hour. Remove and fork through carefully then repeat the process two or three more times. You’ll probably get a few ice crystals, but it will still be delicious. Elaina – pizza followed by ice cream = the perfect lunch. Savory Simple – haha, glad you like! I love alcohol in ice cream, not only for the flavour kick but also because it’s the easiest way (for me) to keep it soft scoop. I think my favourite is the one I’ve made a few times now, soaking chopped up christmas pudding leftovers in brandy and then churning that with vanilla custard. So good! Never heard of whisky cornetto, shame you can’t get it now though, I’d love to try it! oh golly, that does sound good! i love all sorts of praline (try macadamia!) and this ice cream looks divine! Haha! What a cute story that went along with this. And oh gosh this might be one of my favorite ice creams you’ve featured yet… it sounds divine! MMMMMM sounds so good. I’m not a drinker but I have to stock a bar just for cooking and now for making ice cream! Kavey – I know, I reckon I might actually like it now! Choc Chip Uru – thanks! Amy – thank you! It’s simple, but so good. Delicio8 – honestly, I’ve had that bottle of Frangelico for months…keep having to use it in recipes to finish it off! “The kind of pizzeria with no pretensions, just incredible dough rolled paper thin, rich red tomato sauce spread over the top and milky mozzarella dotted between volcanic blisters of risen crust.” you just brought back memories of italy last summer. i know the post is about ice cream, but that line about the pizza really hit it. and you know what, the description of eating a cornetto fits perfectly with the way I used to savour cornetto as a kid. god, it’s been so long since I had one. I much prefer homemade/artisan ice creams as my tastes mature, but I remember now how exciting it was to buy one off the corner shop and rip off the wrapper in circles. great one! This should be sold in stores! I’ve never really been one for alcohol in my ice cream (and I can only imagine my reaction if I’d been fed whisky ice cream as a child!) but I love hazelnut praline. I want your description of pizza ‘pizza’ (right on the money and it made my tum growl) first, and then a huge bowl of your gorgeous ice cream. I love praline in ice cream, and hazelnut makes it that much better! Also – LOVE Frangelico..perfect with it’s nutty counterpart! yes please!! I recently fell in love with frangelico, and have thought about putting it into ice cream. This looks amazing! My Kitchen Stories – glad you like the variations. Elizabeth – haha, thank you! Pencil Kitchen – I think it may have only been in Europe, or Italy specifically. Lorraine – yep, the chocolate tip was always my favourite bit too! Em – ah, hopefully in a good way, not a horrible homesick way?! Kathryn – do try just a little alcohol – it shouldn’t taste too strong and the softening effect is wonderful. Jaime – haha, you’re too sweet! Sarah – do try it, it’s lovely. 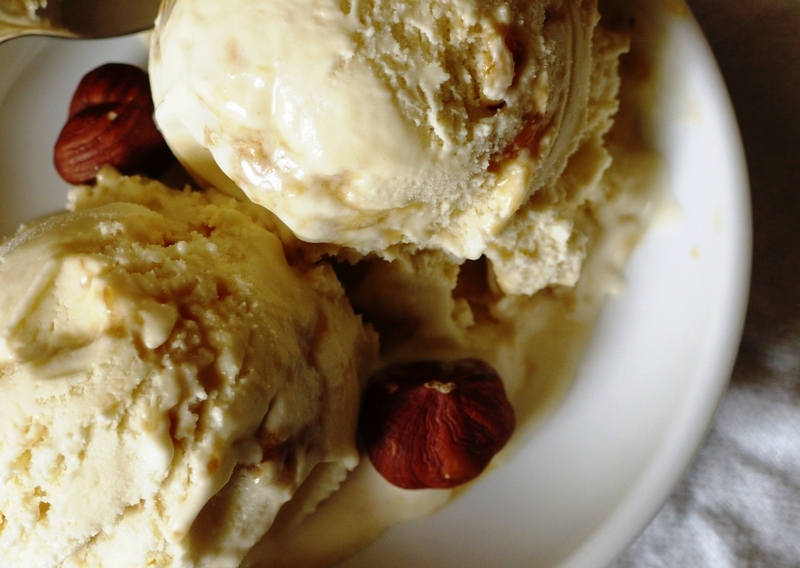 Hazelnut praline is one of my fav things to have in my ice cream! Love the crunch! This looks amazingly delicious! Would love to try! thanks for sharing! I am still laughing at the pudding stomach… I am more for savory than sweet, but there is always an extra compartment for something sweet like ice cream… as my father in law puts it, ice cream helps you digest. So not true, but I almost believe it now. I have had a few Whisky cornetti in my life, and am sure I have seen them around still here in Italy, but I will make it a point to check on that and let you know. I know exactly what I mean by ‘pudding belly’! this icecream looks incredible! Lianne – the soft, sweet caramel crunch in this is sooo good, you have to try! 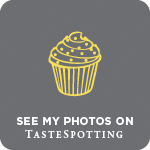 Nuts About Food – ooh do let me know if you manage to find one! Aw, your 5-year old taste buds must have been shocked! LOL I would have hated the whiskey flavor, too. Love your ice cream recipe, though! I don’t have Frangelica. I have orange liquere and Amaretto. What else could I use instead please. ?